This scathing remark, delivered by actor Jesse Eisenberg while portraying Mark Zuckerberg amidst a heated deposition in the 2010 film The Social Network, has a certain pertinence today with regards to the company Zuckerberg founded back in 2004. As Facebook’s news feed algorithm becomes increasingly restricting for brands and publishers, many of us are finding it difficult to capture even the minimum amount of our audience’s attention on the platform. The search for elusive reach on the world’s largest social media channel has led some marketers to explore Facebook Groups as a way to stay visible with users. But it appears the more critical frontier may be Facebook Stories, a feature that is rapidly on the rise and — according to the company’s own top execs — represents the future of connection on Facebook. The Social Network, referenced earlier, is a biographical drama depicting the inception of Facebook and the power struggles that took place. The film was extremely well received, earning eight Oscar nominations and winning three: Best Adapted Screenplay, Best Original Score, and Best Film Editing. Certain people portrayed in the movie have criticized its inaccuracies (it wasn’t exactly kind to Mr. Zuckerberg, as the opening quote in this post illustrates), and writer Aaron Sorkin doesn’t deny playing loose with the facts. A reputed screenwriter, Sorkin understands the power of stories, which have an ability to hook and captivate audiences in a way few other styles of communication can hope to match. This dynamic is undoubtedly driving the growth of “Stories” — series of images and videos played in succession, perfectly suited for mobile screens — across all social media platforms. 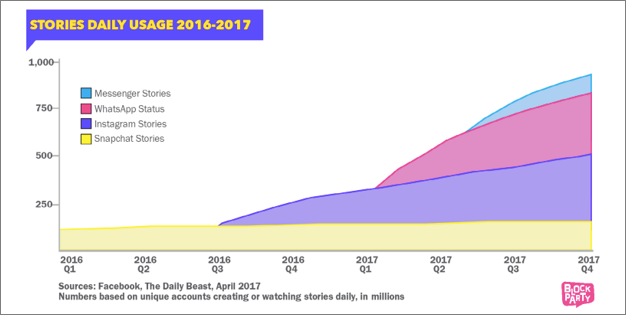 Interestingly, Snapchat — which largely sparked the popularity of this format when its “My Story” feature launched in 2014 — has remained stagnant while other players have gained fast traction. You can definitely count Facebook among them. Originally rolled out on mobile in 2017, Facebook Stories made their way to desktop earlier this year and the feature now boasts 150 million daily active users. Like the versions on Instagram and Snapchat, this content is ephemeral — Facebook Stories and all of their comments disappear after 24 hours. But the convention itself is here to stay. “We expect Stories are on track to overtake posts in feeds as the most common way that people share across all social apps,” said Zuckerberg (the real one, not the Eisenberg character) during a fourth-quarter earnings conference call. The increase in the Stories format is on a path to surpass feeds as the primary way people share things with their friends sometime next year. Needless to say, this is a story marketers need to be tracking. 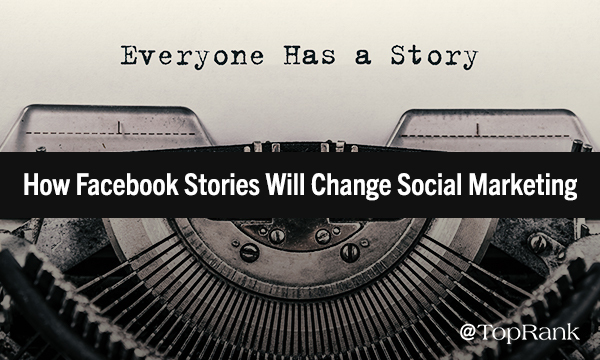 Okay, so we know that Stories are quickly becoming a mainstream method for sharing content on social media, and we know that Facebook is making a firm commitment to the format. What does all this mean to us as marketers? This is definitely a tool that companies can use, if they are so inclined. You have the ability to post them from your brand page, and (at least for now) it may increase your content’s odds of getting noticed. Relatively speaking, this feature isn’t being used all that much, and Facebook’s clear emphasis on growing it means that Stories are carving prime real estate above the news feed. Some view this as the next great social media marketing opportunity on the platform. Earlier this year, Bud Torcom wrote in a piece at Forbes that Facebook Stories are “like California’s mines and creeks before the 1849 gold rush.” He sees this format transforming campaigns through experimentation, experiential marketing, influencer integration, and visual pizzazz. Michelle Cyca sees similar potential, as she wrote on the HootSuite blog, calling Stories “a way to reconnect with users who aren’t seeing your content in their Newsfeed the same way” and calling out examples of campaigns that drove lifts in awareness by incorporating the tactic. The idea of added organic reach is enticing (if fleeting, knowing that the onset of ads will turn this — like all Facebook marketing initiatives — into a pay-to-play space), but what really intrigues me about Stories is the almost infinite grounds for creativity. Facebook Stories Examples from ModCloth and Mashable. It’s a very cool method for visual storytelling. It’s a low-barrier entry point for social video (no one is expecting premium production quality on these). And it presents an accessible avenue for toying with emerging technologies — most notably, augmented reality, which is being strongly integrated into Facebook Stories in another step down the road Snapchat has paved. Where Does the Story Go Next? This advice — delivered to Eisenberg’s Zuckerberg by Justin Timberlake’s Sean Parker in The Social Network — referred to Zuck’s budding Facebook venture, but could just as easily apply to any social media marketer eyeing Stories as a way to connect with their audience. More than anything, though, Facebook Stories are intriguing because they offer a real chance to capture part of a user’s attention — maybe even more than the minimum amount. And since brands generally aren’t tapping into this functionality as of yet, early adopters can jump ahead of the curve and beat their competition to the punch. If there’s one primary takeaway from Facebook’s story (as reflected in The Social Network), it’s the tremendous business value in being first. Just ask the Winklevoss twins. At TopRank Marketing, we’re all about helping companies tell their stories through a wide variety of digital channels and tactics. Give us a shout if you’d like to hear more. What are you thoughts on the future of Facebook stories? Tell us in the comments section below.